DNA Modifications in the Brain: Neuroepigenetic Regulation of Gene Expression begins with an historical overview of the early discoveries surrounding DNA methylation in the mammalian brain and then explores the evidence supporting a role for this epigenetic mechanism in controlling gene expression programs across the lifespan in both normal and diseased states. Chapters describe new directions and technological advances, and provide an overview of what the future holds for this exciting new field. 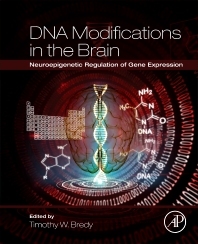 This book is ideal for medical, graduate and advanced undergraduate students, but is also a great resource for researchers who need a broad introduction to the dynamic nature of DNA that sheds light on evolving concepts of gene-environment interaction and their effects on adaptation and neuropsychiatric disease. Chapter 9. What Does the Future Hold for the Study of Nucleic Acid Modifications in the Brain? Dr. Timothy Bredy is Associate Professor of Neuroscience in the Ayala School of Biological Sciences at the University of California Irvine and Senior Research Fellow within the Queensland Brain Institute at the University of Queensland.